Your health system or hospital story doesn’t matter. When it comes to healthcare marketing, the only thing that matters is how your story fits into people’s lives. Simple concept. Tough to deliver on. But critical to your healthcare marketing success. Because it’s the difference between rising above the noise or getting lost in a BIG sea of 5,000 other marketing messages that hit your audience every day; in the context of the average American spending more than 10 hours a day with various media. For the best of brands it’s an epic battle to get consumers to stop and take notice, much less care. For health system and hospital brands, they have to work even harder. Because let’s face it, in a world of retail, fashion, technology, entertainment and consumer brands, you’re like the kid in gym class who gets picked towards the bottom by the two assigned captains in dodge ball. But it doesn’t have to be this way. Every health system or hospital brand deserves to climb higher on the “relevant brands in your customer’s life” roster. Every healthcare brand deserves to tell, and demonstrate, a great story. But it requires a change in perspective. To help your brand improve and grow its standing, you need to help your customers improve and grow. And the more you’re in touch with their larger story, the more you create a brand story that they want to be a part of. You can even take this a step further – don’t tell people a story, give them a story to tell. Nike doesn’t market the features of its inner soles…it empowers everyday athletes. Amazon doesn’t market the technology behind its fulfillment process…it makes life easier and is there whenever you need it (including around the house, thanks to Alexa). Google doesn’t market its algorithms…but through its intuitive services has made itself essential to our everyday lives. Disney doesn’t market the sizes of its theme parks…it transports us to magical experiences. Etsy doesn’t market its technology platform…it connects us with a global community of like-minded curating individuals. Common across these six examples is marketing that leads with a customer problem or aspiration, acknowledges their unmet needs and opportunities, and then uniquely communicates and boldly delivers their solution. It’s marketing that empathizes, connects, inspires and moves people. Said another way, it’s marketing that matters. Because its relevant to a customer’s life. I think we’d all agree that “health” is inherently relevant. But the relevance of our health system and hospital brands gets lost with marketing that too often leads with our health system, hospital, service lines and technology, rather than the customer. It’s the opposite of the above examples. Each of these brands are incessantly relevant, given that their actions transcend just one point in time and are beyond messaging. Rather, they surround us at multiple points throughout the customer journey and through both actions and words. They invite us to take part. All of them have, if you will, rewritten the marketing/communications “playbook”. These brands are platforms to deliver maximum customer value and competitive advantage. They’re not simply trying to manufacture (sell) perceptions. Rather, they deliver the products, services and experiences that in themselves engage customers at deeper strategic levels. All marketers want to change their customers world for the better. How fortunate are we then as healthcare brand builders and marketers! Our sole purpose is to better customers’ lives. And if we do it right, we’ll create customers who build value back to our healthcare brand, which in turn builds value back to our organization. How can healthcare marketers create more meaningful and relevant engagement with customers who are now at the center of the healthcare ecosystem – proactively taking ownership for their health, taking control of the buyer journey and taking control of the media they want to see. AND, how to do this when the size of your wallet might not be as big as the behemoth health system the next county over? If you buy into the premise that creating value (outcomes) creates a virtuous cycle of momentum that moves customers, brands and business upward (reference the brands above); and if you believe that the only thing that matters to customers is how you can make their lives better, then the place to start is with the customer. They are your key to faster and more sustainable growth. Lead With Purpose. It’s the starting point for creating connections and rising above the competition. Call it mission, positioning, promise – doesn’t matter the nomenclature your health system or hospital adapts. But think about it as your energizing brand idea, as it needs to energize inside and outside. Unearth it, declare it, make it tight, meaningful and easy to articulate and then drive everything from that idea. Every piece of evidence shows that purpose drives performance. It attracts employees, inspires and connects customers, fuels growth and drives business. Keep Moving. Incessantly relevant brands anticipate and lead change. Of course, directly linked to their values and objectives. They are committed to wowing customers and keeping them engaged, not once or occasionally, but constantly. Reference the brands above. Given the quickly evolving healthcare market, marketers must adapt a mentality of a bias to action. Which means seeing and thinking beyond the boundaries of healthcare to tap into what really matters to customers. Likely that if you’re guided by the same rules of the game as everyone else, you’ll be nothing more than what everyone else is. Which begs the question – if you’re going to anticipate and lead change, shouldn’t every convention in your organization actually be up for consideration? Focus Your Differentiation. Of all the components fueling your brand, one of the most critical is differentiation. But beyond identifying a meaningful (relevant) point of difference that really matters to consumers, you need to possess the courage to focus on this point of difference. That’s the space that customers crave and that fuels brand and organizational success. Remember that contextual sea of 5,000 messages and 10-plus hours of media consumption a day? I’d say that the best case odds are that you have one overarching theme that stands out. Pull With Emotion. Emotion creates unique meaning and an instinctive attraction that preempts rational reasons for making a purchase. Neurological research supports the premise that people buy on emotion and justify with facts. But it’s not an either or situation. Some categories and brands naturally lean to one approach over the other and each has its place in your marketing toolbox. The challenge is to know which is right for your healthcare system, hospital or service line. Ultimately, your brand itself should guide the decision based on evaluating several dimensions, e.g. uniqueness, price, category perception, importance to prospect, innovative or intangible services. Leverage Your Symbolism. Refer back to the above list of brands. Add to that list Starbucks, The North Face, Pinterest, Adidas, Band-Aid, Red Bull, Lululemon, The Red Cross and Mayo Clinic, to name just a few. All brands on the rise develop their own emotional shorthand and incorporate it into everything they do. Leverage what is uniquely yours – your shapes, colors, images and sounds – to build brand equity and evoke the emotions that trigger our instincts. Let’s face it. Most of our healthcare words read the same. So what other means do you have to break the ties? Be Aligned Across Touchpoints. Brand consistency is a growing challenge today. Not only given the number of “media” touchpoints, but given your likely expanding pre-acute and post-acute continuum of care (e.g. urgent care, infusion centers, ambulatory surgery centers, behavioral, rehab). However, achieving and maintaining alignment – presenting a consistent look, message, emotion and experience across all consumer touchpoints and across all your facilities and service lines – not only creates attraction and belief, but maximizes the value of your marketing budget. Create & Grow Your Tribe. Any relevant brand today feeds the conversation that is 24/7, always on. They create, foster, and facilitate communities of like-minded individuals. This is not only important across clinical service lines like diabetes, cancer, bariatric and pediatric, where patients and families want (and need) to share with one another. It’s also important to your evolving WEllness business, given that the “WE” factor influences so much behavior. Let your health system or hospital brand be the platform through which communities share, learn and grow together. As a healthcare marketer today, there’s no one ingredient for standing out and being fresh and relevant. 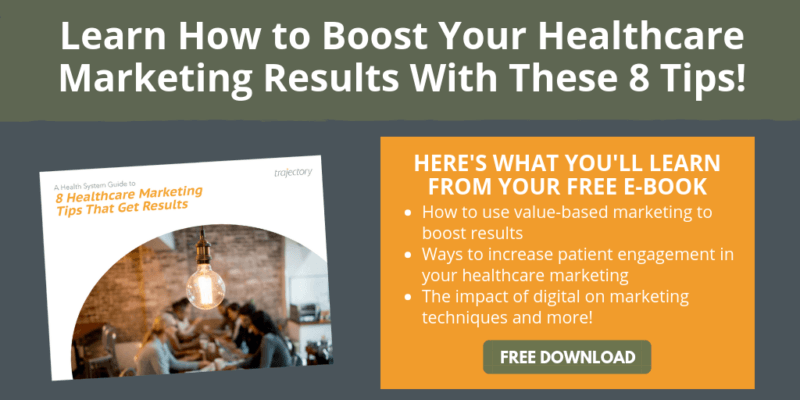 But there are certain characteristics and behaviors – that when applied as a complete framework – can aid your healthcare marketing efforts to shift attitudes and beliefs, attract new customers and grow the value of existing ones. The first starting point is thinking about how you can make your customers’ lives better.